The train service between Ronda and Algeciras is limited. In Algeciras we took the bus to Gibraltar. We knew we had a tight window for sightseeing so we could make it back to Algeciras in time to catch the last train to Ronda. And the rain didn't help at all. But we managed. 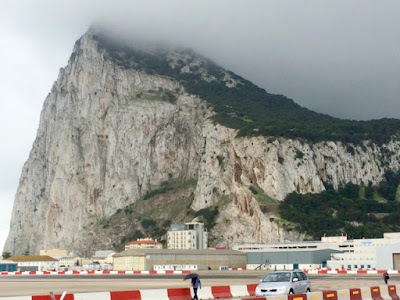 The approach to La Línea de la Concepción on the Spanish side of the peninsula gave us the best glimpse of the 426 meter high limestone rock towering behind the beach and harbor. The Rock was a spectacular sight to behold! We waited for an EasyJet flight to take off before the security barricade was lifted and we could safely cross the runway to get to the city center. Cars, buses, trucks and people moved quickly across the tarmac. In the distance we could see a lot of new construction. Gibraltar's area size is only 2.6 square miles but it's home to some 32,000 people. It's pretty crowded.